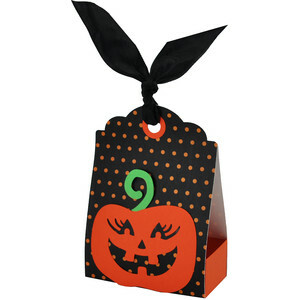 What a sweet way to give a halloween treat or gift! Cut all the elements in colours of your choice. Fold all the perforated score lines upwards and glue tabs to form the box. Adhere the box inside the folded tag by adding adhesive only to the bottom of the box. Add ribbon to hold closed.